Without clean water, decent sanitation and good hygiene, people's health suffers. Fatal diseases and conditions such as cholera, diarrhoea, sepsis, malnutrition, pneumonia, parasites and blinding trachoma can all be spread through contamination of drinking water, soil and food with human faeces and other bodily fluids or medical waste. Of the 17 million people living in Malawi, 2.2 million still don't have access to a clean water facility and 33% of the population has no access to improved sanitation. Globally Malawi is among the countries with the highest maternal and neonatal mortality rates, approximately 20% of which are attributed to sepsis. Our approach to combat this deplorable situation is to prioritise the integration of WASH in health so as to strengthen the sector, and ensure that WASH is recognised by all as a critical component in achieving universal health coverage. For that to happen, WASH needs to be adequately financed. The 'Deliver Life' project, funded by UK aid, means we can work on WASH service provision and Infection Prevention and Control in sixteen HCFs across three districts in Malawi, while facilitating broader engagement of various stakeholders at community, district and national levels for prioritisation of WASH and quality of care in health service delivery. Within the sixteen healthcare facilities we're introducing a variety of facilities such as solar-powered reticulated water supply system, inclusive bathrooms and other sanitary facilities, as well as drilling boreholes in surrounding villages. 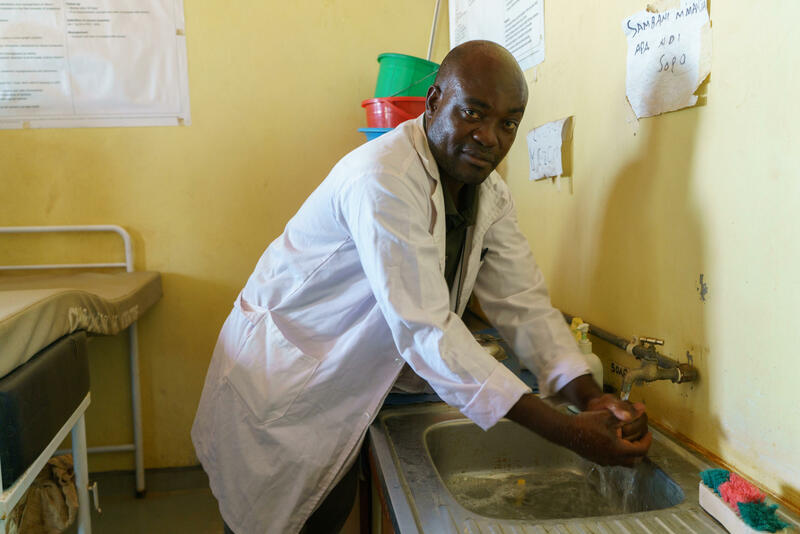 Lottie, Medical Technician in-charge, washing hands before treating a patient at a healthcare facility in Kasungu, Malawi. We promote infection prevention and hygiene behaviour change in healthcare facilities and communities, and we also strive to empower citizens so that they are able to claim their rights to WASH and health. The availability of water, hygienic toilets and bathrooms and clean environments within these facilities has resulted in increased demand for maternal health services, thereby contributing towards improved maternal and neonatal health outcomes through safe deliveries. Empowered and knowledgeable citizens are key to applying pressure and demanding the change required to achieve access to WASH for everyone everywhere.